Bengal Pride captivated Western New York and beyond as Buffalo State officially welcomed its ninth president, Katherine S. Conway-Turner. Traditional media outlets, elected officials and VIPs, community organizations, and you—our social media friends and followers—joined in the conversation of Inauguration Week through feature stories, congratulatory Tweets, and likes on Facebook. Below is a collection of articles and posts that reached more users than ever before. This Facebook video and photo of Niagara Falls illuminated orange alone generated more than 250 shares, 950 likes, and reached nearly 55,000 people in just 48 hours. Thanks for celebrating with us. Go, Bengals! 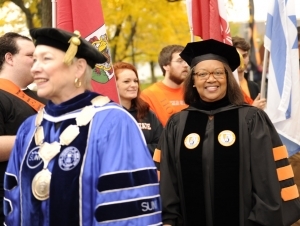 Congratulations to Dr. Katherine Conway Turner on her inauguration and investiture as the President of @buffalostate. Welcome to WNY. So thrilled to be @buffalostate for the Inauguration of Dr. Katherine Conway-Turner #futureisBRIGHT!! !